Each year, the IndyCar Belle Isle Grand Prix in Detroit is an important date on the schedule for both the city and Chevrolet. The weekend-long event includes a variety of different forms of auto racing, including trucks, LeMans cars and, of course, Indy Cars, so it draws a massive crowd to the Motor City for what is really one of the most exciting weekends of motorsports in Detroit each year. As you might imagine, with that big crowd comes lots of money, as fans contribute to the local economy not just at the track, but at the hotels and other supporting businesses in the area. For Chevrolet, the Belle Isle Grand Prix is a chance for the company to show off their successful Indy Car engine program, but it also allows the automaker a chance to feature their high performance road cars in a venue where spectators are obviously very interested in high performance machines. Chevrolet has displays where fans can check out the newest models up close and for the past few years, a Chevy has led the field to the green flag – serving as the most prominent display of the brand’s vehicles. 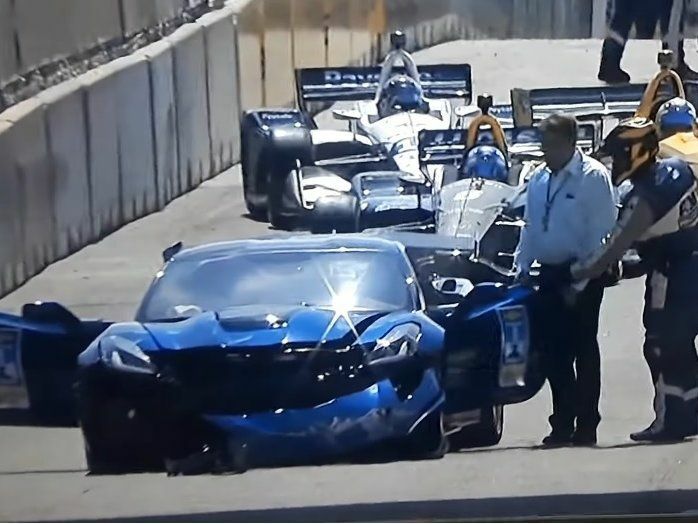 Unfortunately, serving as the pace car for the 2018 IndyCar Belle Isle Grand Prix turned out to be far less prominent for the 2019 Corvette ZR1 than the company had expected, with an exec crashing the car during the very first pace lap. Since the videos of this crash began traveling around the internet yesterday, a great many commenters have been quick to take shots at the driver of this ill-fated Corvette ZR1 – GM Executive Vice President Global Product Development Mark Reuss. These uninformed internet users insist that he is just an average stuffed shirt who has no business behind a vehicle of this nature, but that is far from the truth. As the brief statement from General Motors below points out, Reuss is an experienced driver of high performance test cars along with being a major supporter of the entire GM high performance portfolio. “Reuss is a certified industry pool test driver on the North Course of the Nürburgring track in Germany. He also created and led the GM Performance Division in 2001, when he was responsible for GM racing vehicles, as well as production versions of Chevrolet SS models and the Cadillac V-Series." Considering his experience with GM over the past 20 years, both in masterminding the expansion of the company’s performance lineup and in testing all of their high performance machines, it is nothing short of ignorant to state that this crash happened because he is an inexperienced executive. In fact, as automotive executives go, Reuss is likely one of the most experienced on a road course in a high performance machine. So what happened? Belle Isle claimed another victim and this time, it was a 755-horsepower pace car. There are scores of videos online showing the 2019 Chevrolet Corvette ZR1 pace car crashing, but they all show the same thing from a few different angles. The crash occurred in turn #2 as the field began its first pre-race pace lap. This is a sweeping left-hand turn with a slight rise in the pavement just before the exit of the turn. As we can see in the footage, when the new Corvette hits that rise in the pavement, the tires begin to spin, the back end comes around and the car slams head-first into the track’s outside retaining wall. Fortunately, the field of Indy Cars close behind Reuss and the Corvette was able to stop when the wrecked ZR1 coasted across the track and both Mark Reuss and his passenger escaped without injury. While I have never run a Corvette ZR1 hard on the Belle Isle course, I have run a supercar with a bit less power on a track with a similar rise in the pavement at the transition between a turn and a straightaway. What often happens – and what appears to have happened here – is that as the car hit that rise in the pavement, the suspension setup of the ZR1 was unloaded for just a second. When the suspension was unloaded from that rise in the pavement, there was a split second where the car’s weight was lifted off of the tires, but it appears to be at the point where Reuss began to accelerate out of the turn. The combination of applied power and the lack of weight on the rear wheels forced the car into an extreme oversteer situation that could not be rectified and the new Corvette ZR1 slammed head-long into the outside wall. GM’s official statement claims that track conditions and weather played into the crash and while the Belle Isle course is known for being sketchy at times, anyone who has spent any time on a road course can see in the video that weather and track conditions weren’t at fault here. If not for that rise in the track coming out of turn #2, this crash likely wouldn't have happened. In the long run, while this proves to be an unfortunate situation for General Motors, Chevrolet and the Corvette team, the important news here is that Reuss and his passenger were ok and the race eventually continued as planned. I would say "things happen" and GM is a bit embarrassed. Also wondering if the ‘driver’ is looking for a job with Ford or Toyota this morning....or maybe he had ‘Auto-Pilot’ engaged...? It’s all over FB, message boards but short story, Reuss is VP oversees performance cars, racing, holds FIA and IMSA race licenses, certified to track at Nurburgring. Bet he had PTM set to Tr/race and when he hit the bump in the turn rear got light and came around. Should have left the nannies on Tr/sport at least. Looks like He may have gotten on the power a little to soon . The race cars on the track are still warming their tires. So I think it may be a combination of too much power on cold tires. This was the first warm up lap and I think He takes the turn a little too aggressively. These problems and the ones the author mention ( rise in track which unsprung the suspension) cold tires,too much power, unsprung suspension, rise in track, too aggressive driving. this would be My opinion. Agreed. He's clearly accelerating about a 1/3rd into the corner and it simply got away from him. And his line seems a bit closer to the wall than it needed to be. The safety systems in the car should have been 'On' and I'm betting they were off. He's a confident driver, has driven the course before, and probably felt he didn't need the nannies on. I totally thought the same thing too( too close to the wall) He took an inside line that left him no where to go, as He accelerated (too early I think) out of the turn. Personally I like to take a wider line, so You can see around the corner sooner and find the proper exit point to get back on the power. The driver in video appears to take an awfully aggressive inside line, He also appears to get back on the power too soon. I think if He doesn't oversteer and loose control, He was still going to run the risk of coming out of the turn and slamming into the outside wall. His line through the corner is not leaving him much room on the outside of the end of turn. along with the speed he is carrying through the turn, I think that a wreck was inevitable. Oh yeah, I agree, I bet he also had traction control off, the car comes off the ground, the tires over-spin, and traction control never stepped in and corrected the problem. The car lost traction and you can see the car did not try to stop the wheels from over-spining, the very definition of traction control. Leave the traction control on!!!!!! the car is smarter than the driver in this part. 755 HP maybe leave the it on!!! One more thought, Mark Reuss, what the hell are You thinking?? Big picture Mr. Reuss. The ZR1 was suppose to show that Chevy has corrected the issues with the Z06 (over heating and not being able to control 650 HP) now We see that one of GM's own certified race drivers can't control the new ZR1. Maybe the recent Nurburgring time of 7:12(unofficial) for the ZR1 may be close to its best time? The big picture, maybe the ZR1 isn't has good as We were hoping? Maybe a sub 7 minute time at Nurburgring is out of reach?? After all, it can't complete a warm-up lap at Chevy's Premier Racing event. Maybe an LT5 W/Ceramic brakes, some Multi-matic shocks.....Z28 Camaro will push the 7 minute mark ???? C8....... We all know the C8 Corvette is coming. I have a question?? The new Vette is mid-engine, this may be a perfect example of how a mid-engine is better? The ZR1 can't use all of the downforce (950lbs.) its not going fast enough. This accident may not happen if the weight of the motor is over the rear axle?? The Indy cars that the ZR1 are pacing, are mid- engine. Just food for thought, would mid-engine make a big difference here?? Two 30 year old pick- up trucks are not relevant to this conversation. Those ABS systems are very out dated by todays standards. You really believe the 2018 ZR1 and a 1991 Chevy truck have the same ABS?? 2018 ZR1 ABS = IPAD............ 1991 Chevy truck ABS = Apple II....... Electronics today are light years ahead of the early 90's. Windows(if it existed yet) was still called something like Windows 3.0. Windows 98 is still seven years way in 1991.......Bill; Your own statement starts by saying "back when", ya "back when" is what my point is exactly..... back when ABS was in its infancy.